Next time your kids drags some dirt or mud into the house, don’t freak out. Instead give yourself a hearty pat on the back for raising such a happy, well-adjusted kiddo. 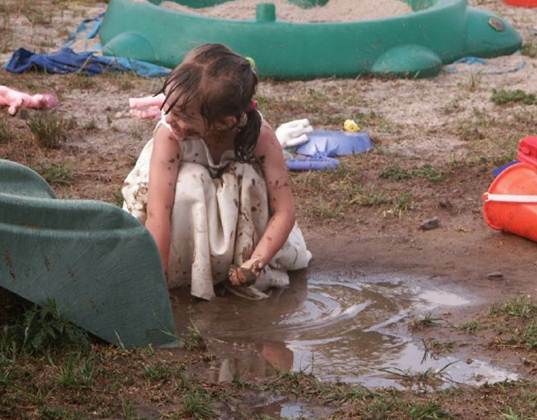 According to a new report from the National Wildlife Federation, “The Dirt on Dirt: How Getting Dirty Outdoors Benefits Kids,” getting messy provides countless benefits for little ones. We live in a germ obsessed society, so much in fact, that those fears may expose us to harmful chemicals, such as those found in antibacterial products. This new NWF report may help drown some of those fears though and keep your kids healthier. The report points to a growing body of research that suggests dirt and germs may actually help build physical health and resilience to diseases. This is connected to the Hygiene Hypothesis, which you may have heard of, that says that when kids are too clean and their exposure to parasites, bacteria, and viruses is limited, they may face a greater chance of having allergies, asthma and other autoimmune diseases. Plus, as we’ve pointed out time and time again, being outside, getting down in the dirt and out into nature is extremely healthy for a child’s emotional and physical well-being. When kids spend more time playing outside than they do attached to indoor, high-tech gadgets, they’re less vulnerable to obesity, stress, ADHD, vitamin D deficiency and depression. Get your kids gardening – and thus digging in the dirt. Make good old fashioned mud pies. Go rock hunting – it may sound tidy, but my son used to dig in the dirt and get super messy while rock hunting. Head to the messy, sandy beach and build a cool castle. Don’t forget the eco-friendly beach toys. Make some mud paintings, on paper or the sidewalk. Too extreme? At least take the finger paints outside. If you’ve got a kiddo who isn’t keen on getting dirty, consider watching the amazing Dirt the Movie or Totoro, both of which may encourage your little one to appreciate dirt and nature. To learn more about the benefits of dirt, or to see more fun outside activities for kids, check out the DIRT report. Next time your kids drags some dirt or mud into the house, don't freak out. Instead give yourself a hearty pat on the back for raising such a happy, well-adjusted kiddo. 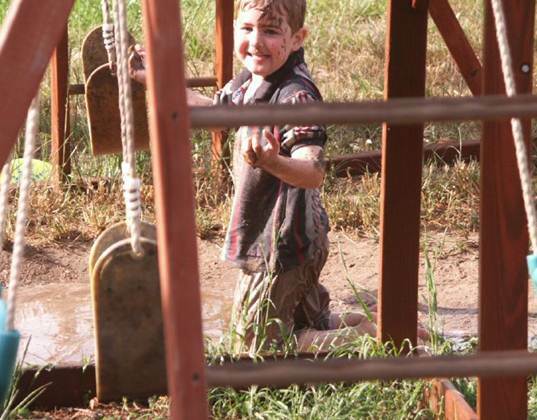 According to a new report from the National Wildlife Federation, �The Dirt on Dirt: How Getting Dirty Outdoors Benefits Kids,� getting messy provides countless benefits for little ones. We live in a germ obsessed society, so much in fact, that those fears may expose us to harmful chemicals, such as those found in antibacterial products. This new NWF report may help drown some of those fears though and keep your kids healthier. The report points to a growing body of research that suggests dirt and germs may actually help build physical health and resilience to diseases. This is connected to the Hygiene Hypothesis, which you may have heard of, that says that when kids are too clean and their exposure to parasites, bacteria, and viruses is limited, they may face a greater chance of having allergies, asthma and other autoimmune diseases. Plus, as we've pointed out time and time again, being outside, getting down in the dirt and out into nature is extremely healthy for a child's emotional and physical well-being. When kids spend more time playing outside than they do attached to indoor, high-tech gadgets, they're less vulnerable to obesity, stress, ADHD, vitamin D deficiency and depression.